One thing we can know about cave paintings is they tended to show stuff outside the cave. So art got started as a way of showing what was not actually visible at the time. 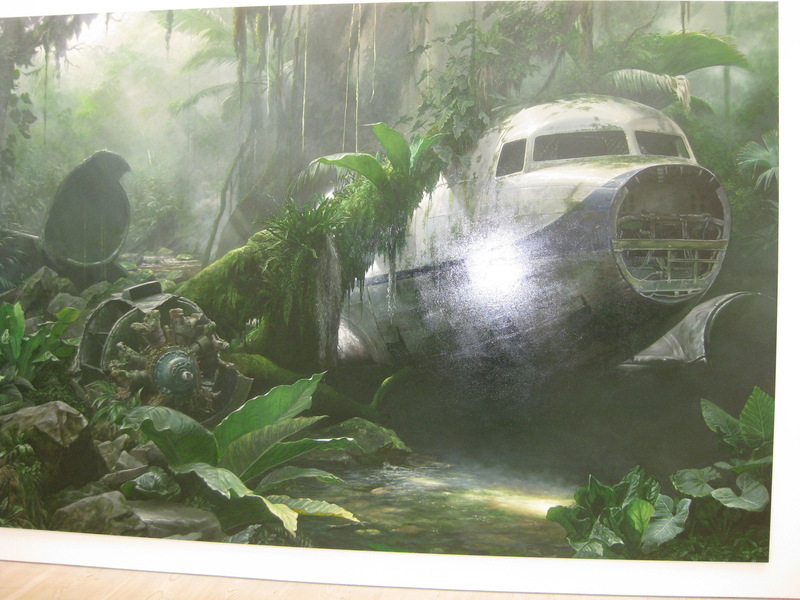 Take this scene of a passenger jet stranded in a jungle. A film crew would have gone all the way to a sub-tropical location to get an image like this. Wateridge has not left his studio. Of course, films get made in studios and paintings get made from nature. But perhaps imagining and recording are still the fundamental aspects of fine art and camerawork respectively. Where there is little question a scene was painted from life, art becomes an invitation to imagine, rather than an argument to believe. So painting seems more honest than film. They say the camera never lies, but it lies by implication. Film-makers make an apparent claim to witness the most fantastical stuff. The work in question mixes it up. 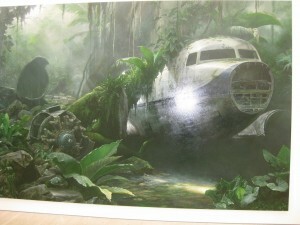 The artist has made a model of a plane and crashed that in his studio, using the technique of an SFX department to spur on his vision. Call this a piece of self-deception. But there may be a trick like this behind every great work of the imagination. Three paintings by Jonathan Wateridge can be seen in Newspeak: British Art Now Part II at Saatchi Gallery until April 17 2011.